Last night, we tried to clear out some stuff from our kitchen and we found a pack of dried flower mushrooms aka Shiitake Mushrooms. We look up online, found a shiitake mushroom recipe and decided on it with what we can find in our fridge. Original recipe can be found here. We added prawns, although we are in going through the change of becoming vegetarians. We still have left over prawns in our fridge but throwing them away will be a waste so we out them in. A total of 6 pieces. The star in this recipe is mushrooms. We got the pack from Hock Hua, a local medical hall. Melt butter and olive oil in pan. Add Italian seasoning, shallots and garlic to the pan. Saute them until the garlic starts to turn light brown. Then add sliced mushrooms and garlic salt. Stir fry until mushrooms are cooked and evenly coated in the butter. Add the vegetable stock and let it simmer for a few minutes. When the mushrooms are tender, turn off the heat. Throw all the broccoli into a pot and boiled to green. You will notice they turn bright green, but letting them stay too long and you will end up with yellowish broccoli. 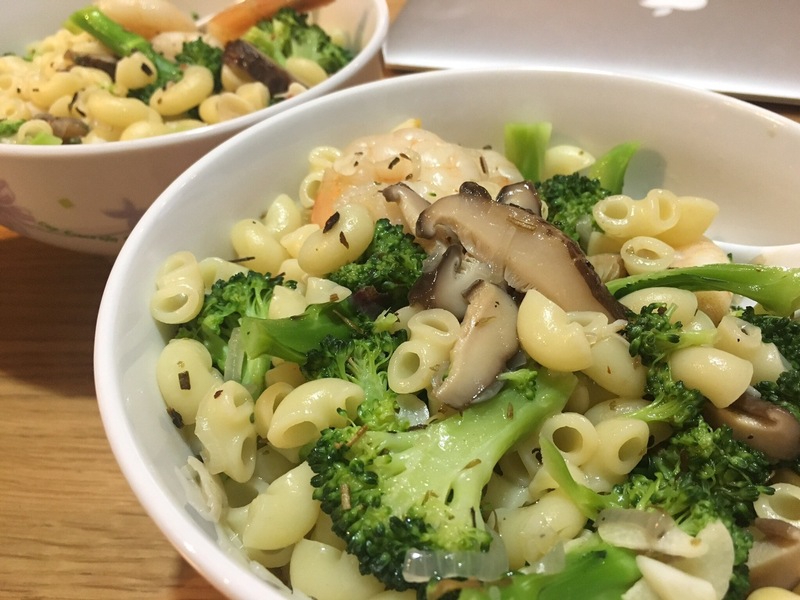 Get an awesome bowl, put in the boiled broccoli and cooked macaroni. Pour in the desired amount of cooked stew with mushrooms.Top with some chilli flakes (optional), parsley and black pepper before serving. We tried to do an ad hoc Live video. Next What’s your breakfast today?